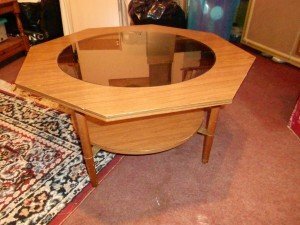 An octagonal solid wood coffee table inlaid to the top with black mirrored glass, with a circular shelf underneath. 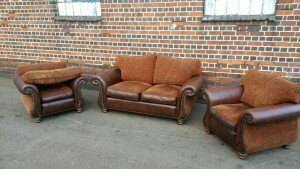 A three piece Chesterfield sofa suite, comprising a large two seater sofa and two matching armchairs, upholstered in brown rustic leather and lighter brown velour, on circular carved wood feet. 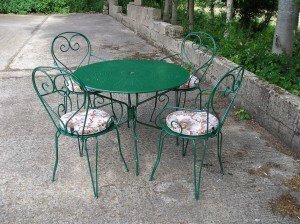 A dark green painted cast iron garden set, comprising a circular dining table and four matching chairs, together with four circular patterned cushions. 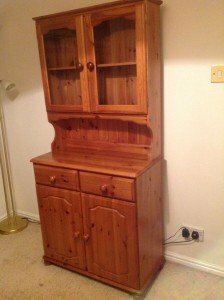 A modern solid oak kitchen unit dresser, having an upper cupboard with glass inlaid doors, two drawers with another cupboard underneath. 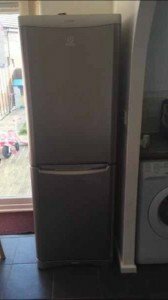 An Indesit tall standing two in one fridge freezer in silver, three drawers in the freezer. 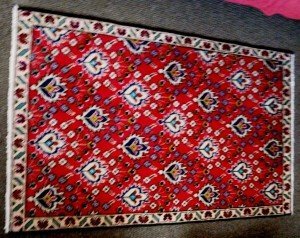 A large vintage style Persian ornate rug, heavily patterned in many colours agains a red ground. 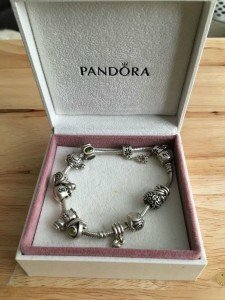 A silver pandora charm bracelet with 12 pandora charms, in original pandora box. 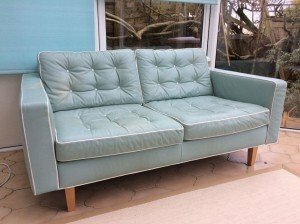 A contemporary Italian two seater sofa on wooden legs, upholstered in duck egg blue leather with white button detailing. 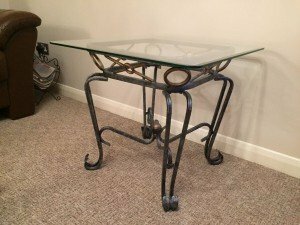 A vintage style cast iron side table, topped with a square, rounded corner glass table top. 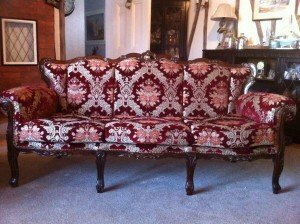 A reproduction Victorian style three seater high back sofa, on a heavily carved mahogany base and upholstered in silver and red damask velour. 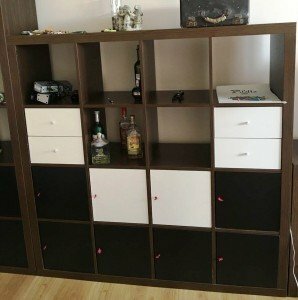 A large contemporary solid wood storage/ shelving unit, comprising six shelves, four drawers and eight cupboards. 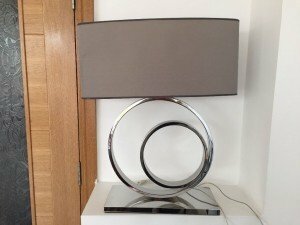 A large chrome decorative circular table lamp on a rectangular base, with rectangular taupe shade. 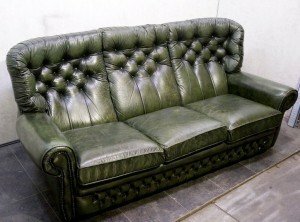 A vintage Chesterfield three seater high back sofa, upholstered in deep green authentic leather with button back detailing. 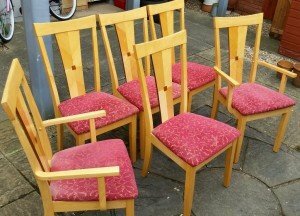 A set of six solid wood modern high back dining chairs, upholstered in patterned red fabric. 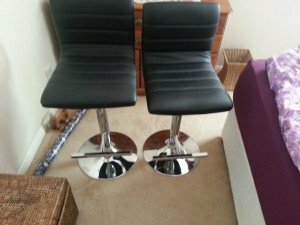 A matching pair of chrome swivel bar stools with foot rests, upholstered in black faux leather. 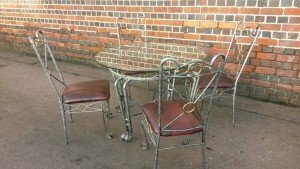 An Art Deco style garden suite, comprising a large dining table topped with glass, together with four matching chairs, upholstered in oxblood red faux leather. 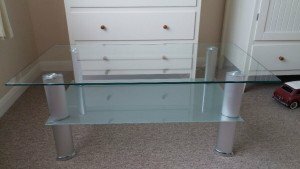 A two tier glass and chrome coffee table, with a clear glass top and shaded glass shelf underneath. 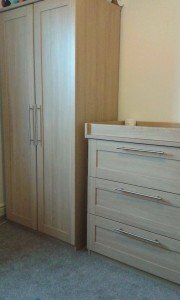 A light oak two door tall standing wardrobe, together with matching chest of drawers, with chrome handle detailing to both. 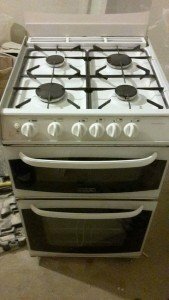 A free standing white Hotpoint gas oven with grill, four hobbs to the top and a splash back. 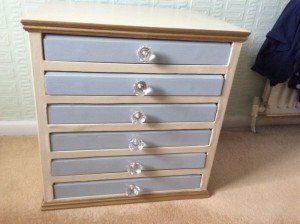 A solid wood bedside chest of drawers, with six slim blue jewellery drawers and crystal knobs.